Confession time – I have never been a fan of the slow cooker. Personally, I felt that the food produced was one-dimensional, that flavors were leeched out of the ingredients and to me everything tasted the same. I tell a story where I remember my mom tossing a beef roast in an avocado colored slow cooker, covering it in water, adding no spices, seasonings or aromatics and letting it cook all day. My mom wasn’t much of a cook – but she would have made a fine cobbler as that meat would have been one sturdy pair of shoes. Today we have better quality appliances and books being written that address that way today’s cook likes to cook and more importantly, eat! 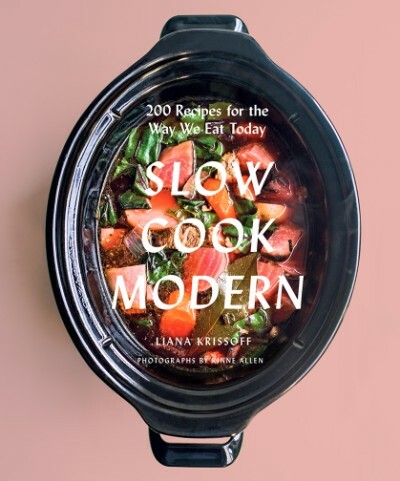 One such book that I am quite taken with is Slow Cook Modern by Liana Krissoff . The recipes totally speak to me – international flavors and spices, complex dishes with loads of recipes for accompaniments to the slow cooker meal that aren’t made in the slow cooker. Liana shares one crave-worthy dish after another such as Kasoori Methi Chicken (with a recipe for Boy Choy Brown Basmatic Rice as an accompaniment), Curried Pork Loin, and Garlicky Pork Ribs Soup with Tamarind and Greens. I am in the middle of house hunting – which has been on hold due to some medical issues with my son. Many of my cookbooks, kitchen items are packed away – and somehow both of the slow cookers I own are entombed behind a wall of boxes in my garage. Boxes and bins full of cookbooks and cookware block my access. So, what did I do – I go out and buy a third slow cooker so I could make the recipes in this title – because they are that tempting. The author shares many tips and advice on slow cooker food safety, ways to round out a meal, other tools you will need to be a star in the kitchen, and a wealth of meals that will keep your family and friends happy and full. 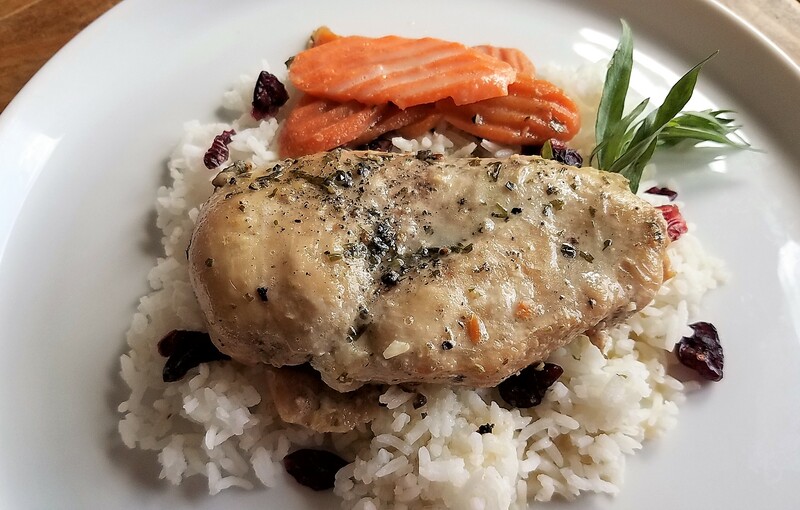 My favorite recipe so far has been the Tarragon and Crème Fraîche Chicken (recipe below) pictured above (I did sub breasts for thighs because that is what I had on hand and adjusted the cooking time). I made this on a day that I did not want to cook and it was painless and delicious and the sauce made the dish. Liana has made slow cooking much more attractive to slow cook lovers and new converts like myself delivering flavor-packed dishes and easy approachable recipes. Slow Cook Modern will be a valuable tool in any busy cook’s kitchen. In a large skillet or sauté pan, heat 1 tbsp of the oil over medium-high heat until it shimmers. Sprinkle the chicken thighs with 1 heaping tsp of the tarragon, several pinches of salt, and several grindings of pepper, then add to the pan, folded into little bundles with the smooth side out (the way they’re often packaged in the store) so they fit in the pan. Cook until nicely browned on the bottom, 3 to 5 minutes, then use tongs to turn them over and brown the opposite side. Transfer them to the slow cooker, still shaped into their compact bundles. Return the pan to medium heat and add the remaining 1 tbsp oil. Add the shallots and a pinch of salt and cook, stirring frequently, until softened and lightly browned, about 3 minutes, then add the brandy (if using) and 240ml water and stir up any browned bits from the pan. Scrape into the cooker. Cover and cook on low for 8 hours. Using a slotted spoon or tongs, remove the chicken to a bowl (along with some of the shallots). Stir the crème fraîche and remaining 1 heaping tsp tarragon into the sauce in the cooker and season with salt and pepper to taste. Return the chicken to the sauce and serve. Abrams Books provided a copy of this book to me as a part of the Abrams Dinner Party. Opinions are my own. 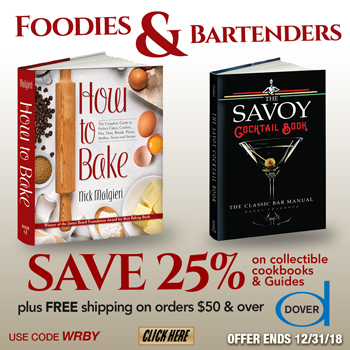 Savory is my thing – give me something salty or acidic and I am a happy girl – although if you add a savory aspect to some desserts – I can be persuaded. Over the last few years, I have been experimenting with different types of vinegar – adding a splash to sauces and dishes for just a hit of flavor and finding that I enjoy the acidic aspects to many dishes. 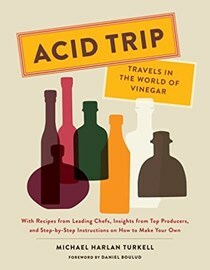 Michael Harlan Turkell’s Acid Trip: Travels in the World of Vinegar arrived from Abrams as a part of the Abrams Dinner Party this year and I could not wait to dive in. The author who also happens to be a world-class photographer as well shares recipes from leading chefs, insights from top vinegar producers and step-by-step instructions on how we can make our own vinegar at home. Making our own product takes patience but is far superior to store bought the author shares. Organized by country/region with a wealth of information from the locals, it is a true encyclopedia to this ingredient. Vinegar is the wallflower of the pantry, it sits on the shelf waiting for us to grab it and when that moment comes it brings flavor and balance to a dish, adds much-needed acid, can be used to deglaze a pan and so much more. The photographs here are stunning, the content invaluable and the recipes incredible – after all, they originate from top chefs. The first recipe I tried was Pancetta Cooked in Balsamic Vinegar (from Sara Jenkins, Porsena, New York City) which only took minutes but completely wowed us all. I look forward to making this again when we have company – but for now, we were grateful to have it all to ourselves. 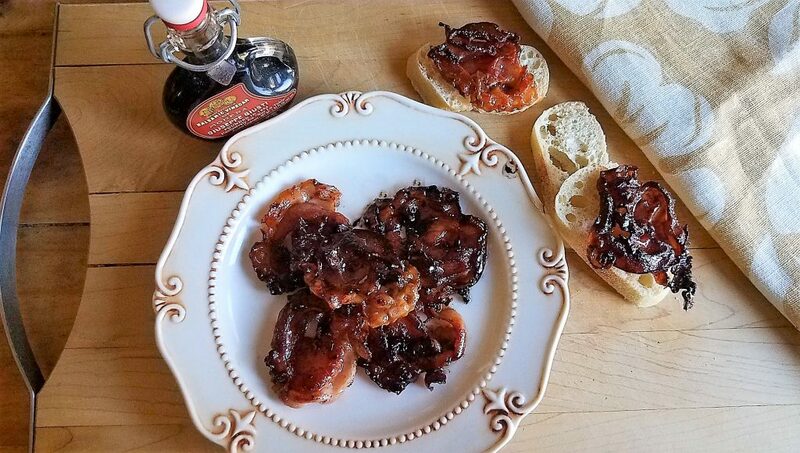 Fry up some pancetta until crispy and add some balsamic and magically you have a super delicious appetizer. I have also made the vinegar butter sauce for a chicken dish – that was out of this world. More fun with vinegar, including making my own, will be coming soon. Acid Trip is a must have for any serious cook. Thanks to Abrams Books for sharing this title as a part of the Abrams Dinner Party. 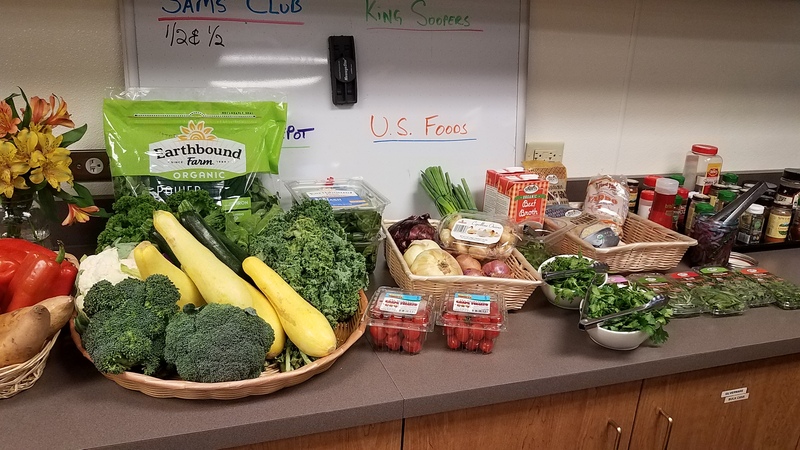 No one throws an event like Sprouts Farmers Market and the Colorado Beef Council. Last November, I was able to attend an event where I learned to make the perfect roast. At that “meatup”, I came to love prime rib – I had never been a fan until that night – and my husband was converted as well. Don’t get me wrong – he loves his steak and beef – but the prime rib was never his thing – until I made it for Christmas dinner using what I learned that night. The recent event was all about grilling and was great fun. Our team of bloggers were able to select our own ingredients from the pantry and had our choice of a sirloin, rib eye or tenderloin to grill (it was a little like Chopped and I loved it). 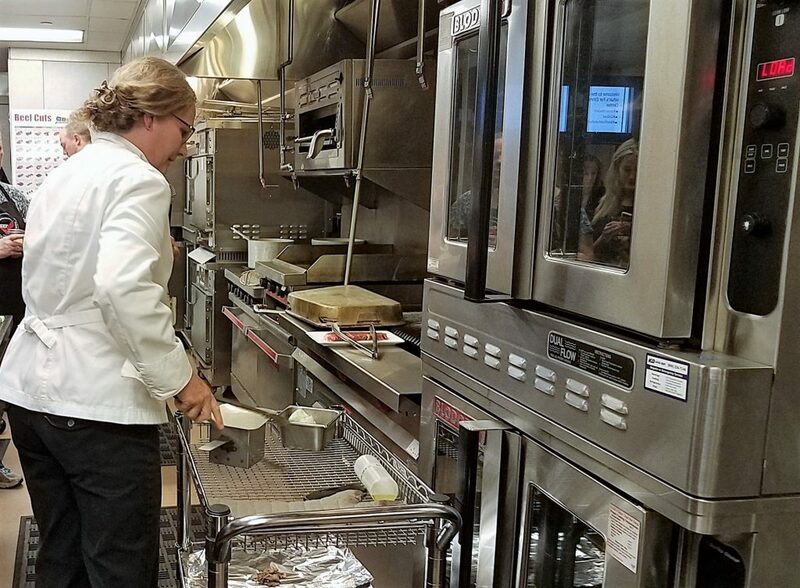 It was great fun to cook in the Colorado Beef Council’s professional kitchen and cook beside fellow food lovers and friends. One of the Sprouts’ meat managers shared information on the two types of beef they carry – 100 percent grass fed with no antibiotics and the other type – natural beef which is grass fed and grain finished and the latter does not receive antibiotics for at least the last 300 days before butchering. We also learned that Colorado ranchers couldn’t keep up with the demand for organic beef – which is the reason Sprouts isn’t able to carry it. A reminder to folks who have Sprouts markets in their areas – the butchers will help you with any special cuts or instructions you may need (i.e., deboning a chicken and more). 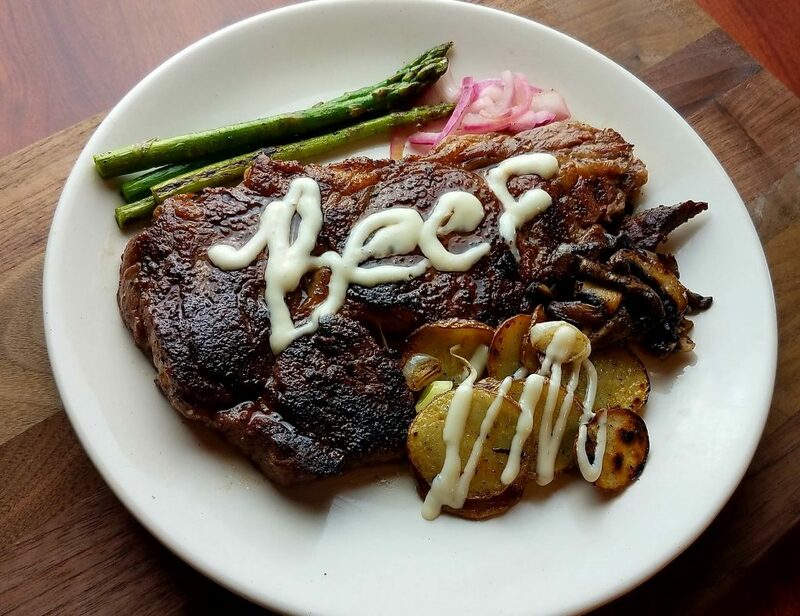 The culinary team cleared up a few misconceptions about grilling beef. I had always been under the impression that it was best to allow the meat to come to room temp for more even cooking. The team said that is not necessary at all – and in fact, no meat should be brought to room temp. (Once I had read a blogger’s post where he said to let your whole chicken come to room temperature – I say nay nay to that advice). We were also reminded that beef is healthy on its own – it is the sauces, butter and sour creamed potatoes and other sides that accompany it. After we reviewed the proper way to season steaks and the various ways to grill (cast iron, grill pan, professional grill) we moved over to the professional grill to learn about smoking meet indoors as well as getting those professional looking grill marks on our steaks. Then it was time to cook – we picked our cut, grabbed our ingredients and turned up the heat. I also pan sear my steak – burning hot cast iron pan – salt and lots of black pepper and finish with a touch of butter to baste. My husband raves about this method. After we cooked our meal, we were able to plate and then have a close-up taken by a chef with professional lighting. Of course, I had to be silly and use horseradish sauce to make beef graffiti. My plate isn’t much to look at but it was delicious (I am of the school of thought – that less is more) – I saved most of the steak for my hubby who told me don’t bother coming home if you don’t bring home the beef. While we ate, we were treated to a slide show of our creations – and I think I should have won a prize for the most laughter. Thanks to Sprouts Farmers Market and Colorado Beef Council for sponsoring and hosting this event! 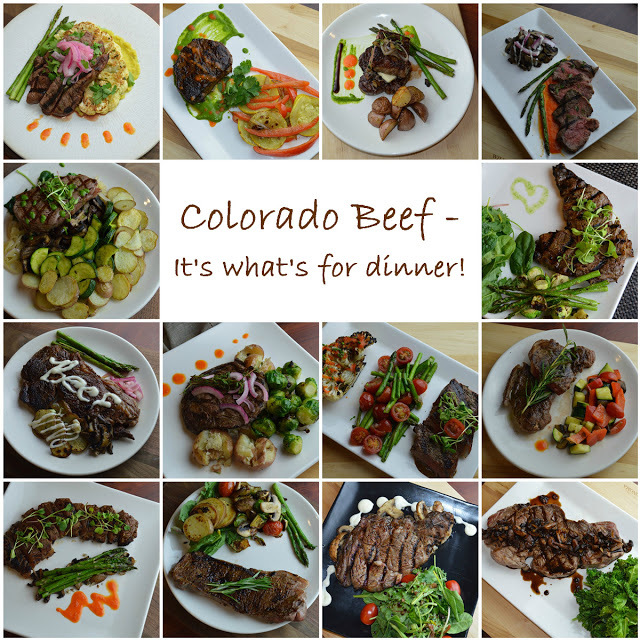 Collage photo courtesy of Colorado Beef Council.